Exilarch (761-771?). He was a younger brother of Anan ben David, the founder of Karaism; according to the Karaites, whose contention was that Anan's father was the son of the exilarch Ḥasdai, he was a nephew of Solomon ben Ḥasdai. 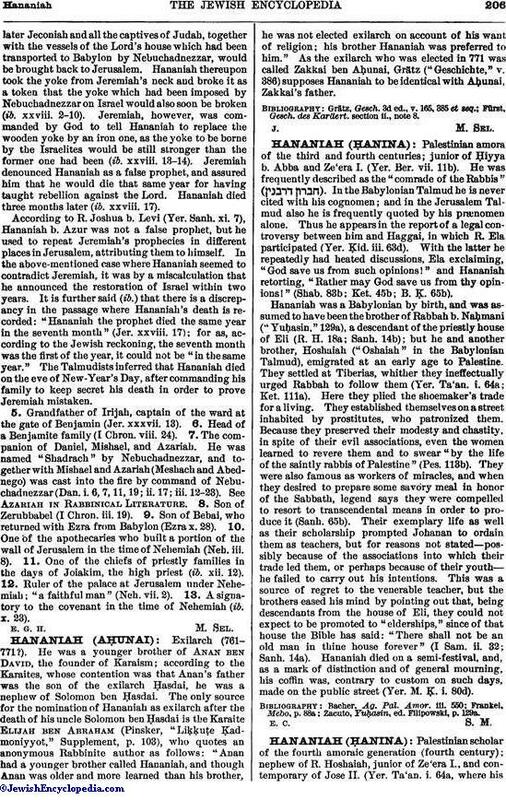 The only source for the nomination of Hananiah as exilarch after the death of his uncle Solomon ben Ḥasdai is the Karaite Elijah ben Abraham (Pinsker, "Liḳḳuṭe Ḳadmoniyyot," Supplement, p. 103), who quotes an anonymous Rabbinite author as follows: "Anan had a younger brother called Hananiah, and though Anan was older and more learned than his brother, he was not elected exilarch on account of his want of religion; his brother Hananiah was preferred to him." As the exilarch who was elected in 771 was called Zakkai ben Aḥunai, Grätz ("Geschichte," v. 386) supposes Hananiah to be identical with Aḥunai, Zakkai's father. Fürst, Gesch. des Karüert. section ii., note 8.